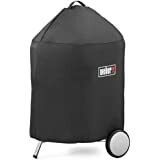 The One-Touch cleaning system provides hassle free cleanup of charcoal ash and debris by swiping it into a high-capacity, removable ash catcher. 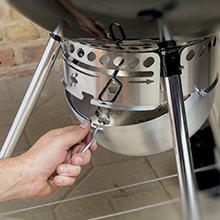 Control the temperature of your grill, without lifting the lid, by easily adjusting the dampers. Closing the dampers completely will cut the oxygen flow to help extinguish coals. 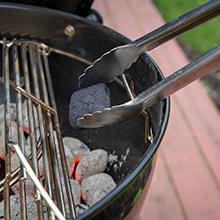 Arrange charcoal on the fuel grate for either direct or indirect grilling. 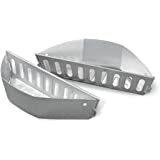 Cooking grate is easy to clean, retains heat, and is hinged for easily adding charcoal while grilling. 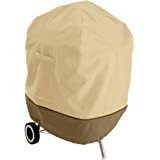 The heat shield helps prevent your lid handle from getting too hot. 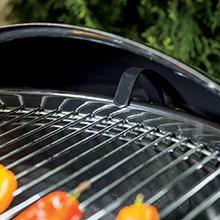 The angled lid hook allows you to conveniently hang your lid on the side of the grill to avoid placing it on the ground. Hang your grilling tools, such as spatulas and tongs, on the hooks for easy access and organization of your workspace. 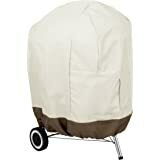 The durable wheels allow you to easily move your grill around the yard, and will withstand the elements. • WARNING: This product can expose you to chemicals including nickel, which is known to the State of California to cause cancer. For more information go to www.P65Warnings.ca.gov. • Combustion byproducts produced when using this product contain chemicals known to the State of California to cause cancer, birth defects, or other reproductive harm. 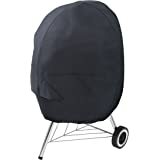 • WARNING: This product can expose you to soot, which is known to the State of California to cause cancer, and carbon monoxide, which is known to the State of California to cause birth defects or other reproductive harm. For more information go to www.P65Warnings.ca.gov. 5.0 out of 5 starsFirst time griller success! First off, I have to tell you that this is the first grill I have ever used. As a single woman, I was never interested in grilling until I bought a house two years ago and built a deck in the backyard. With all that outdoor space to enjoy, I just knew I needed a grill for entertaining (and feeding) family and friends. I thought I might buy a grill and just let my dad or brother handle the grilling, but much to my surprise I really got into it and loved grilling hamburgers and hot dogs on this Weber kettle grill for my first backyard party just yesterday! 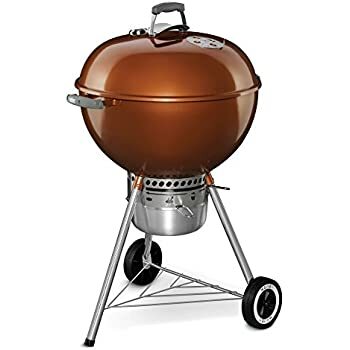 I did a lot of research prior to purchasing this grill from Amazon. 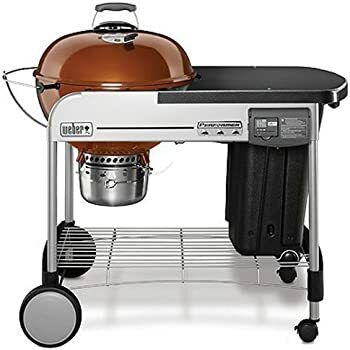 I chose a charcoal grill over propane because I didn't want to deal with propane tanks (a friend had his grill go up in flames because of a loose hose and nearly burned his house down--No thank you! 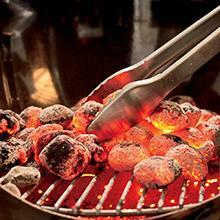 ), I like the taste and smell from charcoal grills more, and most importantly because of the cost. 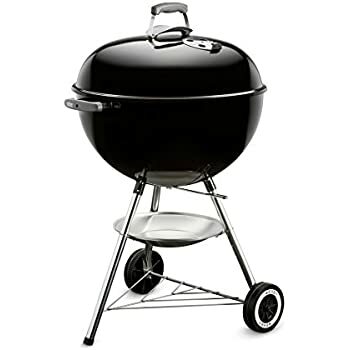 It was less expensive to get a nice charcoal grill like this one than to get an equally nice propane grill. The entry cost into grilling was more reasonable with a charcoal grill. 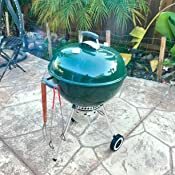 This freed up funds to get some important accessories, which I recommend to anyone buying this grill: a chimney starter, grilling tools like tongs, fork, etc, a steel brush to clean the grates, the Weber Fire starter cubes, and some heavy duty mitts to protect your hands and forearms while grilling. 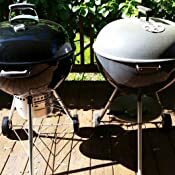 I purchased all these from Amazon at the same time I purchased the grill. 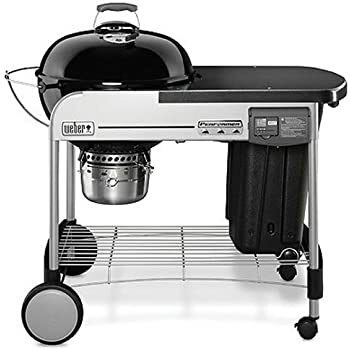 As for choosing a which charcoal grill to get, I chose this model over the lesser expensive model because of the ash catcher, and I'm glad I did. The grill arrived in its original box and was easy to put together on my own, with the exception of attaching the ash catcher itself. But I just kept trying (and referring to the picture-only instructions) and eventually got it. It was put together in about 40 minutes, and that was putting it together myself. One of the best things I did was lookup videos online about this grill to see how it was used and put together. 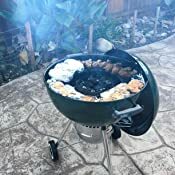 I learned about closing the vents on the lid and on the bottom to reduce heat, and how to quickly get the charcoal ready for grilling by using a chimney starter and Weber Fire Starter cubes (which I highly recommend getting). 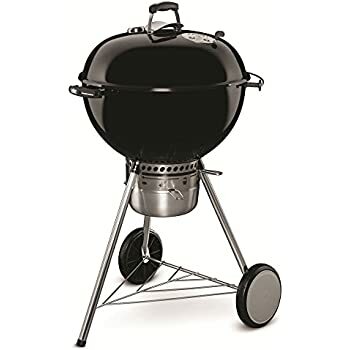 As my brother and dad arrived to my house yesterday for our Memorial Day BBQ, each were skeptical about this charcoal grill because they have propane grills at home and like the convenience of them. "It will take an hour to get to coals ready," said my brother. "Those burgers are way too thick to cook through. They'll be raw in the middle," said my dad. Both were surprised when the charcoal was ready within about 20 minutes using the chimney! And after getting some nice grill marks on both sides of the burgers, I put the lid on and closed the vents to let them finish cooking the middle of the burgers in a lower heat. The burgers turned out perfectly! The best compliment was Dad and others asking me how I grilled these thick burgers so well without burning them to dust. LOL! It's all in the vents! And I think investing in an awesome grill helped, too. When we downsized from our big family home to a townhouse with a small balcony, we gave up our large gas grill but we found we really missed grilling. 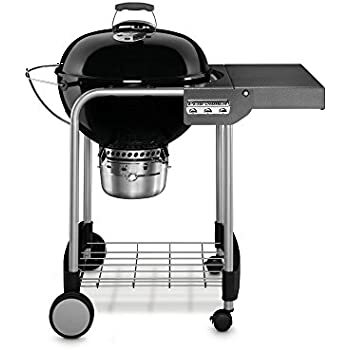 Since we have always preferred the flavor of foods grilled over charcoal to those cooked on the gas grill, we decided to purchase a new charcoal grill. 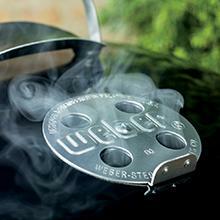 Having had several Webers in various sizes in the past, this grill was a natural choice. My kids and I chipped in and bought it for my very hard-to-buy-for husband for his November birthday. He was thrilled with the rich copper color which we are using as an accent color throughout our home. The grill was easy to assemble, only taking a few minutes. 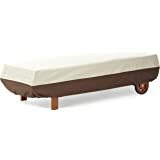 It is sturdy and has a very “quality” look and feel. Normally it is just the two of us eating but the grilling surface is huge and easily accommodates cooking for a crowd. I think we did 12 burgers and a few hot dogs at once for a family party. 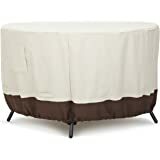 We have used it for chicken, grilled veggies, steaks, pork roast, grilled pineapple and more. In fact, I rarely turn on my stove now! Once of our favorite easy meals is to add a few extra topping and extra cheese to a frozen pizza and bake it on the hot grill…much better than take-out pizza and so quick and convenient! 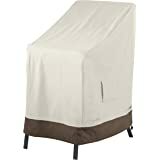 Back in the day, the ash catchers on charcoal grills were messy and difficult to empty without getting covered in soot. Not so with the new design which does a better job of containing the ashes and makes clean up a breeze. We oil the grates with a little olive oil spray before cooking making cleaning the grates less of a chore. 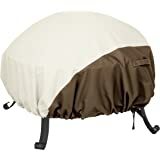 There are other handy “new” features as well such as the lid handle that does not get hot and hooks for hanging your utensils. Most importantly to us, the grill, even with its huge cooking surface, does not take up a lot of space on our tiny deck (not like a bulky gas grill). 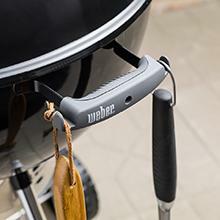 We love our Weber Kettle and recommend it to anyone looking for a grill. 5.0 out of 5 starsWeber Charcoal Grill # 3! This is my 3rd Weber charcoal grill in 46 years. The design improvements are many. The box arrived in fine condition. No damage from the journey at all. The assembly instructions are visual only, no words. Very clear and well done. 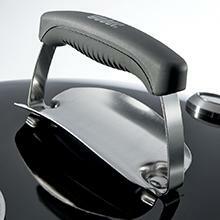 The new side handle design is a very welcome improvement. One on each side now. The top handle is massively improved over the old wood piece. The ash catcher and the interior blades to open and close the grill bottom are brilliantly designed and effortless to install. The blades inside are very well fitted. Excellent tolerances maintained. 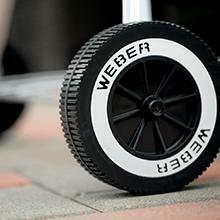 Welcome to the family Weber number 3!